OK this is by popular demand, from forum users to show my Tandem Island mods. I have around 500 miles on the boat to date with the mods and everything seems to work well in pretty much all conditions when used wisely (you don't raise the spinnaker in 4 ft waves and 25 knot winds (Duh). The Hydrofoils are not to raise the entire boat out of the water like those crazy Moth boats, but do serve the purpose of raising the boat just enough to keep my bottom dry, and keep the bow from nose diving (not fun in 60 deg water). The outboard motor is only for emergency use, for when I am 30 miles from my car and the wind dies, or the rudder breaks, and I am exhausted. I keep the boat on top of my car, and it takes around 35 minutes to unload off the car and setup by myself. I sail mostly around Sarasota, Florida and Key West, and am out pretty much every weekend on an adventure somewhere year round. I'm also an avid Scuba diver and love to combine my two hobbies. 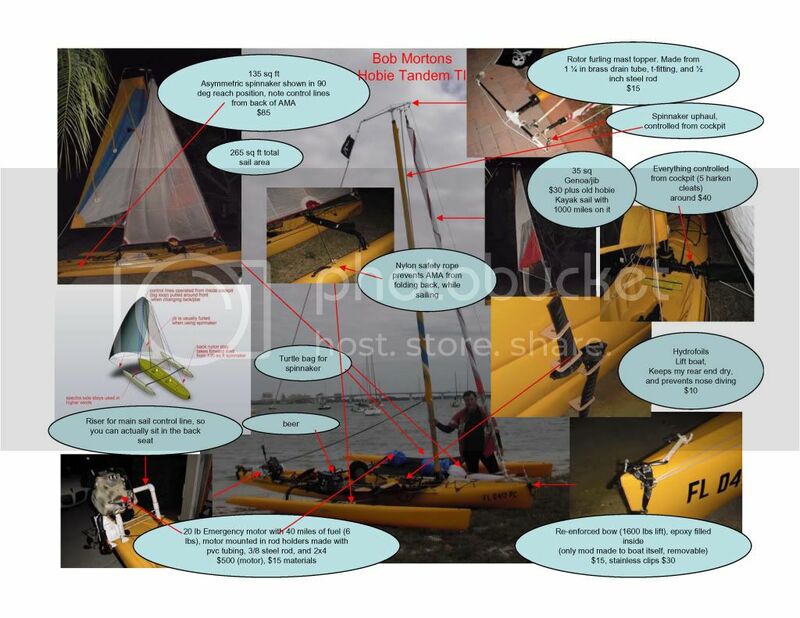 Here is a link to hi def pictures of the boat on photobucket http://s281.photobucket.com/albums/kk22 ... /?start=20. My only word of warning to anyone is don't do these mods unless you have a pretty good understanding of sailing, and engineering, because if done incorrectly you will exceed the design intent of the boat and it will break, and you could die (don't blame me). There is alot of rigging, that has never gotten tangled yet, but I keep a knife handy just in case. I'm happy to answer any questions, and will post some video one of these days (hard to video yourself). Bob - thanks for sharing your amazing collection of inventions/mods. I would be pushing to even imagine some of them - but you have taken them to the point of realisation. A real "hamburger with the lot!" Pretty good effort. Gold star AND and elephant stamp I think. Holy cow!!! Now that's what I call a fully sailed TI. Looks awesome. How does she handle in strong winds? Plus I noticed some registration numbers on the hull...do TIs have to be registered in Florida? In Australia, we're lucky, TIs are considered kayaks. So do not have to be registered like yachts, boats, catamarans or PWCs. "Intelligence is nothing without imagination"
Yes in Florida anything over 16 ft has to be registered, I was chased down and pulled over by the Kayak police (fish and game), and told to register, I tried to out run them, but they had a scarab (just kidding about trying to out run them). It's only like ten bucks or so. Very nice setup,,, would be interested to see more pics of the hydrofoil setup.. Would that mod work on an AI ? I was out today actually, in 30 mph winds and 4 ft waves, not on purpose, it came up on me. I would say my is TI pretty lousy in high winds (over 25mph), it is still pretty managable in 20 mph winds, but still not fun especially when it's rough, 5 to 17 mph is the most fun for me. The biggest problem is the tramps, they catch the wind and you have to hike out on the tramps to keep from tipping over ( I should have folded them up, but I was a little busy). Even the wind surfers were giving it up for the day (thats a bad sign, since those guys are a little nuts anyway). In that much wind I have a difficult time going up wind at all, and the boat side slips alot in a reach, I had the sail reefed less than half out. There was a beautiful Hobie Getaway that launched about the same time I did and we both came back in at about the same time, those guys actually flipped, and had to limp back in with their sail almost down. If you go to that link I had in the original post to photobucket, there are some hi res pics showing the Hydrofoils. All the Hobie mirage drive units are basically hydrofoils (thats the way they work), but they are normally used only for propulsion. Hobies design of the fins themselves is one of the most efficient hydrofoil designs I have seen, I am only exploiting their built in capability to my advantage. Basically those little extra fins push up against hull and adjust the attack angle of the mirage fins so it raises the bow up in the water when you have the foot pedal pushed all the way forward (in one direction). The bottom of the hull takes the added force (not the mirage drive unit). The fins don't seem to affect the normal operation of the mirage drive, but they are a little harder to to get in and out of the drive well, but not impossible, and when the Hydrofoil fins are installed, you may not want to beach the boat with the mirage drive in (most people don't anyway, beaching tears the drives up pretty fast even without the hydrofoil fins). Short answer, the mod should work on any sailing Kayak with a mirage drive (would have to be custom for each type of hull though). The actual attack angle is not real critical, just getting the fins tilted down is all thats neccessary. If I ever make any more, I will likely make the little fins out of a 1/4 inch thick kitchen cutting board (those white HDPE ones that are pretty rigid, less than $5 I'm sure at Walmart). They are cheap and easy to make, try making several with different attack angles, but I'm guessing more than 8 degrees or so will create too much drag , we only need to raise the bow a little anyway. Actually the Hydrofoils in the picture I made 3 or 4 years ago and used on my Mirage Oasis (traded in for TI), and Revolution kayaks, so I'm sure they will work well on your AI. With those boats I didn't have AMA's but had a retractable 25 lb keel weight centerboard about 15 inches under the boat which makes the boat un-tippable (like a monohull sailboat). 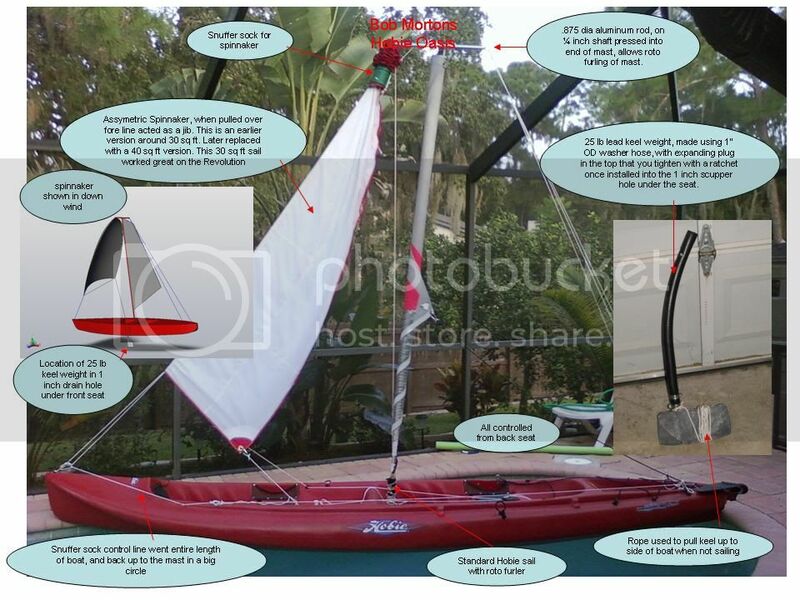 I had a 40 sq ft assymetric spinnaker and the standard Hobie sail (now on my TI (modified)). The reason for the hydrofoils was I was trying get the severely overloaded (with expedition gear) boats out of the water. The Oasis was going to be my entry into the Watertribe EC challenge (http://www.watertribe.com) which is a 300 mile kayak race from Ft Desoto Fl to Key largo, but didn't have enough storage space by the time I got all the gear on board the boats were too overloaded. So the Foils went into the drawer under my work bench until I modified them slightly for the Tandem Islands larger mirage drives. The hydrofoils seem to solve my nose diving problem. This Tandem Island will likely be my entry in next years EC challenge. Honestly I may never enter the EC challenge ( I don't like going out in open sea without my emergency motor), but it's been alot of fun getting prepared and testing everything on smaller challenges every weekend with that as my ultimate goal. On this forum I talked about having to rough out 30-35 mph winds and 4 ft waves yesterday that came up suddenly. Well watching the local news tonight, a fellow Kayaker died in those conditions yesterday near Ft Desoto, FL. This sport can be dangerous and anyone going out needs to dress appropriately for the conditions and make sure you have shore support with check in times, If you don't check in, they can alert athorities with your planned route. Because you never know whats going to happen in the ocean. He apparently died of hypothermia in the 60 degree waters with his life preserver on after getting separated from his buddy who was rescued. Thanks for taking the time to post details of your very innovative and impressive mods! Would you have any pics of your earlier keel weighted centreboard? Sure no problem, like I mentioned, this was my old Oasis that I traded in the my TI, (couldn't get enough gear on for expeditions) I had over 500 miles on the boat as shown I bought the boat in 2007 with lots of fun times kayaking and sailing all over the country with no major problems. As a scuba diver I have easy access to the lead, and melted down some old weight belts to make the keel. All the rigging also fits on my wifes Hobie revolution which is an awesome kayak. ■All vessels, with the exception of non-motor-powered vessels less than 16 feet in length, non-motor-powered canoes, kayaks, racing shells, or rowing sculls, regardless of length, must be registered through your local Tax Collector's Office. Your's definitely needs to be registered because you use a motor but I have never been stopped with my TI and I have sailed next to many patrol boats from both the Jacksonville and St. Augustine police departments, the Coast Guard, and even US Customs. Were you using your motor when you were stopped? The guy had a uniform on (could have been a ups guy for all I know) and said since the boat was over 16 feet ( TI is 18.5 feet ), it should probably be registered, but he didn't give me a ticket or anything (probably a grey area). That very same weekend was when my wife and I got stuck outside of Sarasota Bay big pass in the gulf with the tide going out and no wind at all at sunset. It took us an hour and a half of hard pedaling against the current (strong currents in big pass) to get back in. I went out the next week and bought my 2 hp emergency motor so with the motor it had to be registered anyway, I went ahead and registered the boat ( I think it was around ten bucks). The guys at the Hobie dealership (Economy Tackle) were kind of suprised, and said no one had ever asked before for a certificate of origin for a Kayak (so I could register), but this was back in May or June, and the TI was pretty new then. My recommendation is unless you are planning to put a motor on, and no one bothers you about it, don't bother registering the boat. However I would assume a registered boat is less likely to be stolen (tracable).